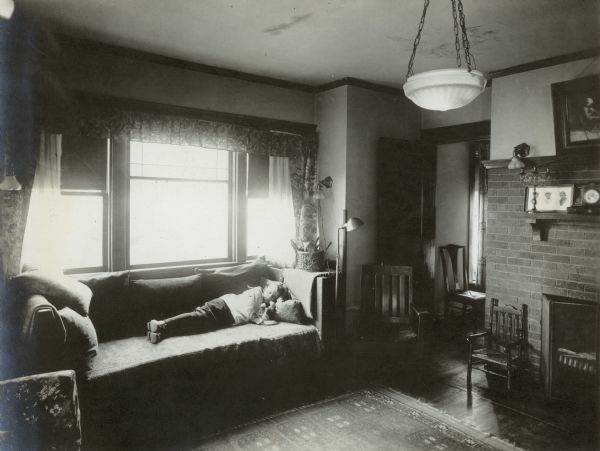 Jenkin Lloyd Jones, born Nov. 1, 1911, sleeping on the sofa in the living room of his parents, the Richard & Georgia Lloyd Jones, home 1010 Walker Court (now 1010 Rutledge Court). The Richard & Georgia Lloyd Jones Sr. family photo album was donated to the WHS by their granddaughter Georgia Lloyd Jones Snoke. Richard Lloyd Jones Sr. was editor and publisher of the Wisconsin State Journal from 1911 to 1919. In the late summer of 1919 the family moved to Tulsa, Oklahoma, where Richard had purchased the Tulsa Democrat, renaming it the Tulsa Tribune, and served as its editor and publisher until his retirement.